Like the athletes and competitors on the field, many mobile operators are working to get their networks in shape and fighting fit to deliver 5G enterprise services to live sports and esports event organisers, according to a recent survey by Ovum on behalf of Amdocs. Operators are eyeing the opportunities to not only give fans a more innovative experience via 5G services in the stadium but also make the arenas more efficient. According to the survey, 87% of network operators intend to offer 5G services to major event enterprises. While 82% of operators said they plan to offer Internet of Things (IoT)-type services that would improve stadium management, more than half of operators said they aim to offer services that would improve the fan experience, such as being able to order food and drinks from their mobile devices. By being part of the sports ecosystem, the potential benefits to operators include increased average revenue per user (APRU), growth of their enterprise businesses, improved customer loyalty, attracting new subscribers as well as expanding brand awareness among different consumer demographics. Almost half of operators surveyed said that 5G will propel higher ARPU and about one third said it will drive enterprise business growth. For operators that run sports-related businesses, such as media services, half of respondents said they expect to add more sports TV subscribers, thanks to 5G. In addition, many operators (42%) said that virtual reality services will go mainstream with 5G. To succeed in the 5G sports market opportunity, the survey found that operators are already thinking about partnering with other ecosystem players, including tournament organisers, social media companies, device manufacturers as well as video game companies. 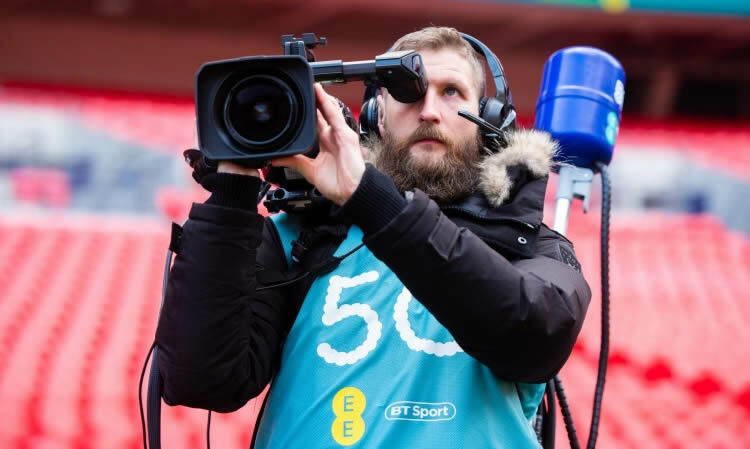 Furthermore, a majority of operators (75%) plan to ink partnerships with broadcasters and over the top (OTT) service providers to discover new ways of delivering sports content to customers. And 73% said they want to partner with virtual reality app providers. This entry was posted in Uncategorized and tagged 5G, 5G sports coverage, Internet of Things, IoT on March 18, 2019 by Tim Cosgrove. Nokia has been selected by French power utility EDF’s R&D unit to test the performance of LPWA wireless networking technologies – key emerging standards for Internet of Things (IoT) device connectivity – to support critical operations for industries. The two companies will engage in a comprehensive testing regime, among the first of its kind in the industry, exploring the capabilities of LPWA technologies to support real-world industrial applications. Nokia is EDF R&D’s exclusive partner for this effort. EDF R&D will utilize Nokia TestHub Services in Nokia’s Device Testing Lab in France – which gives customers access to state-of-the-art, carrier-grade wireless infrastructure – when testing IoT/M2M objects, chipsets, modules and user devices across all wireless technologies and frequencies. This enables devices to be tested on real network infrastructure rather than a simulated network, which reduces guesswork in testing and analysis and minimizes risks in advance of widespread commercial introduction. The testing will compare IoT technologies recently standardized by the 3G Partnership Project (3GPP) – including NarrowBand-IoT (NB-IoT) and LTE-Machine (LTE-M) (also known as enhanced Machine-Type Communications or eMTC) – with other emerging, largely unlicensed IoT technologies. This agreement builds on Nokia’s strong track-record providing mission-critical networks toindustries, and highlights the company’s strong position in the emerging market for IoT connectivity. It also highlights the progress of Nokia’s strategy of expanding its customer base outside of the traditional telecommunications sphere, a key focus of the company’s diversification efforts. This entry was posted in IoT and tagged EDF, Internet of Things, IoT, LPWA, nokia on February 7, 2018 by Tim Cosgrove. Researchers at The University of Manchester have devised graphene sensors embedded into RFIDs, which have the potential to revolutionise the Internet of Things (IoT). By layering graphene-oxide (a derivative of graphene) over graphene to create a flexible heterostructure the team have developed humidity sensors for remote sensing with the ability to connect to any wireless network. Graphene was the world’s first two-dimensional material isolated in 2004 at The University of Manchester, it is stronger than steel, lightweight, flexible and more conductive than copper. Since then a whole family of other 2D materials have been discovered and continues to grow. Using graphene and other 2D materials, scientists can layer these materials, similar to stacking bricks of Lego in a precisely chosen sequence known as van der Waals heterostructures to create high-performance structures tailored to a specific purpose. As reported in Scientific Reports, the groundbreaking nature of this development is that such sensors can be printed layer-by-layer for scalable and mass production at very low cost. The device also requires no battery source as it harvests power from the receiver. Sensors with a RFID enabler are at the heart of the IoT. This new development can provide various applications such as battery-free smart wireless monitoring for manufacturing processes that are sensitive to moisture, food safety, healthcare and nuclear waste. The developed technique has the potential to simplify how the information is gathered through its wireless system, nor is it is limited to a particular wireless network and has the ability to be compatible with networks including WiFi and 5G. Dr Zhirun Hu who led the work said: The excitement does not end with this new application here, but leads to the future possibilities of integrations of this technique with other 2D materials to open up a new horizon of wireless sensing applications. Professor Sir Kostya Novoselov, who won the Nobel Prize in Physics and coordinated the project, added: It is the first example of the printable technology where several 2D materials come together to create a functional device immediately suitable for industrial applications. The Internet of Things is the fast growing segment of technology, and I’m sure that 2D materials will play an important role there. This entry was posted in IoT and tagged 2D materials, 5G, Graphene, Internet of Things, IoT, Manchester University, RFID, sensors, WiFi on January 11, 2018 by Tim Cosgrove. China Telecom and Ericsson (NASDAQ: ERIC) have launched the China Telecom IoT Open Platform – a global connection management platform that will support China’s “One Belt One Road” strategy and accelerate the deployment of Internet of Things (IoT) solutions and services. The China Telecom IoT Open Platform enables enterprises to deploy, control and scale the management of IoT devices through partnerships. With this platform, enterprise customers can integrate their business processes with the managed connectivity service offered by China Telecom to create highly reliable IoT solutions. China Telecom and its industry customers will use the platform to drive the digital transformation of industries in China and beyond. The China Telecom IoT Open Platform is powered by Ericsson’s Device Connection Platform – a global, unified platform that is being used by multiple enterprise customers in various industries to manage IoT connection services worldwide. The platform offers enterprise customers reliable connectivity based on service-level agreements and a common, unified overview of devices and access networks. Ericsson’s Device Connection Platform was launched in 2012 and now supports more than 25 operators and over 2,000 enterprise customers as part of Ericsson’s IoT Accelerator platform. Ericsson also collaborates with the Bridge Alliance and the Global M2M Association to realize the vision of a seamless customer experience with worldwide coverage and superior service quality for IoT applications. This entry was posted in IoT and tagged China Telecom, connected devices, Ericsson, Internet of Things, IoT on July 6, 2017 by Tim Cosgrove. London, June 29, 2017 – Telit, a global enabler of the Internet of Things (IoT), together with OT-Morpho, a world leader in digital security & identification technologies, announced today that the companies are partnering together to solve the challenges facing the mass adoption of IoT via today’s traditional deployment methodology. Together, Telit and OT-Morpho will leverage their combined technical expertise as well as their worldwide customer and carrier eco-systems to jumpstart the IoT narrowband cellular economy. The focus will be on streamlining the provisioning and subscription management process for next generation Cat-M and NB-IoT connectivity. “OT-Morpho and Telit see the massive opportunity represented by the IoT market and believe that as key ecosystem players they have a vital role to fulfill in helping MNOs and enterprises roll out their IoT strategies. By streamlining subscription management and by bringing solutions that can enhance the security and integrity of connected devices, we are fulfilling critical industry needs in order for the IoT to reach its full potential,” said Didier Lamouche, CEO of OT-Morpho. This entry was posted in IoT and tagged Internet of Things, IoT, NB-IoT connectivity, OT-Morpho, Telit on July 5, 2017 by Tim Cosgrove. Deutsche Telekom today offers its first NarrowBand IoT (NB-IoT) service packages in Germany as it rapidly expands the availability of the NB-IoT network across its footprint and sets the scene for its 2020 5G communications standard. The ready-for-sale NB-IoT service packages in Germany consist of two options: NB-IoT Access, a streamlined NB-IoT device connectivity package, as well as NB-IoT Access & Cloud of Things, a more comprehensive NB-IoT product connectivity package, which also includes Deutsche Telekom’s Cloud of Things platform. The NB-IoT Access entry package is available from EUR 199 and includes a 6-month activation of up to 25 SIM-cards with 500 KB per SIM pooled in Germany’s NB-IoT network. As a further optional add-on – a private APN with IPsec-key encryption is available. The NB-IoT Access & Cloud of Things entry package is available from EUR 299 and additionally includes direct access to Deutsche Telekom’s Cloud of Things platform for device and data management. Both packages will enable customers to easily prototype their NB-IoT solutions and pilot them in their markets. A full NB-IoT service pricing is available on request. In parallel to the European NB-IoT network rollout and commercial introduction in Germany, Deutsche Telekom already actively works with numerous customers and partners on the implementation of real-live solutions using the innovative technology. Smart parking is one such area: In Hamburg, a smart parking service is being introduced, which provides information about parking spaces to drivers in real time, digitizing up to 11,000 public and private spaces, including parking garages, with the support of Deutsche Telekom’s NB-IoT technology. Darmstadt, Duisburg, Dortmund, Merzig and Moers will also introduce smart parking solutions in their city centers, enabling citizens to book parking spaces even ahead of time for a worry-free visit. For the parking search in real-time, sensor data transmitted via NB-IoT is being evaluated in combination with information from parking payment machines and other data sources across town to generate reliable probability calculations. The commercial introduction of new, standardized and cost-effective NB-IoT services comes on the heels of Deutsche Telekom’s NB-IoT network expansion across its markets. The nationwide rollout in The Netherlands has been finalized at the end of May, making it the first country worldwide to be completely covered by an NB-IoT network with services already being offered to selected customers. 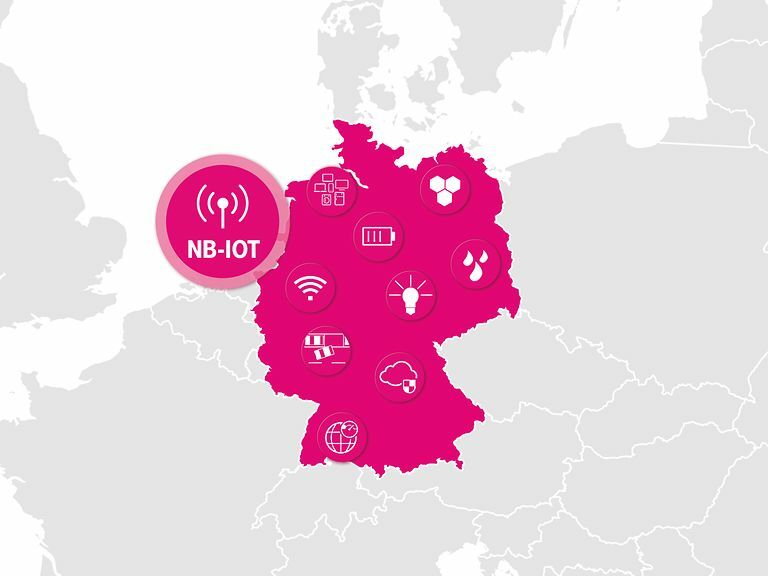 The rollout in Germany is progressing well, and other countries within Deutsche Telekom’s footprint, including Greece, Poland, Hungary, Austria, Slovakia and Croatia are also preparing to introduce NB-IoT. In the US, T-Mobile plans to support NB-IoT from 2018 onwards. The NB-IoT technology is hailed as the most robust answer to current customer demand for innovative Internet of Things solutions. Its key advantages are the low-cost factor due to low bandwidth demand, good in-building coverage, extremely long battery life of connected devices, as well as its usage of licensed spectrum and approved standardization by 3GPP. As digitization filters into just about all aspects of life, NB-IoT is designed for large-scale use and paves the road to 5G, Deutsche Telekom’s completely new network concept, which integrates fixed and mobile networks. This entry was posted in IoT and tagged 5G, Deutsche Telekom, Internet of Things, NB-IoT on June 27, 2017 by Tim Cosgrove. Gemalto , the world leader in digital security, has been selected to supply its On-Demand Connectivity (ODC) solution for Bridge Alliance, a partnership of 34 leading mobile network operators (MNOs) in Asia Pacific, Middle East, and Africa, representing over 800 million customers. Deployed by Gemalto, On-Demand Connectivity, when paired with embedded SIMs (eSIM), eliminates logistics challenges of provisioning online connectivity in different territories forInternet of Things (IoT) device makers and service providers. Through the remote subscription management, users can easily connect to any Bridge Alliance Member Operator’s network, allowing them to immediately access the Internet with their devices, and manage their mobile subscriptions with ease. This solution is compatible with GSMA’s Embedded SIM M2M specifications for industrial IoT applications, and GSMA’s Embedded SIM specifications for consumer devices. IoT is one of the fastest-growing markets today. Based on IHS Markit’s 2016 projections, there will be 20 billion connected devices in use in 2017. This installed base of IoT devices will continue to expand to 30 billion in 2020, and hit 75 billion in 2025*. There is also a market shift from highly specialized to cross-industry IoT devices. An example is the use of connected light bulbs, which can be implemented for different sectors. “IoT is the backbone of many emerging trends and technologies like Industry 4.0 and Big Data“, said Sashidhar Thothadri, Vice President of Sales South Asia & Japan at Gemalto. “As the interest grows, we are excited to deliver a truly flexible way to connect any IoT device – from connected cars to wearables and other industrial M2M applications – across a large geographical footprint, thanks to Bridge Alliance members’ networks”. This entry was posted in IoT and tagged Bridge Alliance, Connected Cars, Eileen Tan, ESIM, Gemalto, GSMA's, Internet of Things, IoT, On-Demand Connectivity, Sashidhar Thothadri on February 1, 2017 by Tim Cosgrove. Combination of Libelium IoT hardware and Telit IoT services reduces time-to-market for IoT deployments. Pick from Libelium’s portfolio of over 110 different Waspmote Plug and Sense!Sensors. Use Meshlium IoT gateways and the embedded Telit Cloud Connector to receive sensor data and forward it to the internet via Ethernet or 4G/3G/GPRS protocols. Create a free Telit IoT Portal account. Users can develop mobile and web-based apps or integrate any back-office databases or analytics systems with data collected from the Libelium WaspMote IoT Ecosystem. The Telit IoT Portal is a cloud-based IoT subscription service, powered by Telit’s deviceWISE IoT Platform. The Platform-as-a-Service (PaaS) features a low cost pay-as-you-go service plan that lets you get started without any upfront investment. Telit’s do-it-yourself cloud service enables instant access to all the necessary tools and resources for all Telit Services, and lets you create and manage your own IoT solutions from a single, intuitive web interface. The Meshlium Gateways act as a central access point for Libelium’s portfolio of wireless network sensors which are useful for collecting data in any scenario, including smart parking, air and noise pollution, irrigation control, vineyard monitoring, and more. The Meshlium Gateway also boasts impressive smartphone, cellular, and hands-free mobile phone detection, useful for gaining business intelligence through the measurement of people and cars with the goal of enhancing user experience in shopping areas and roads. As a part of this new collaboration, Telit and Libelium will be offering a fully integrated sensor-to-cloud solution on Libelium’s click-and-buy online store, the IoT Marketplace. This combination of Telit IoT services and Libelium gateways and sensor devices placed together in an easy-to-use integration kit simplifies the IoT implementation process for enterprises both large and small. The development kit is currently available for purchase in European, American, Australian, and Brazilian versions. This entry was posted in IoT and tagged Internet of Things, IoT, John Keever, Libelium, Telit, waspmote plug & sense on November 18, 2016 by Tim Cosgrove. Gemalto, the world leader in digital security, is partnering with LTE chipmaker Sequans Communications S.A. (NYSE: SQNS) to revolutionize Internet of Things (IoT) connectivity with LTE-M technology. The companies are demonstrating at GSMA Mobility Live! in Atlanta, the first Cat M1 IoT solution, based on Sequans’ genuine Cat M1 chip, delivering the greatest level of network efficiency and simplicity achieved to date. The solution significantly improves power saving capabilities to extend the lifespan of IoT devices while boosting performance in indoor environments. It is ideal for low bandwidth IoT use cases including alarm systems, asset trackers, smart meters, smart city controllers, wearables and industrial sensors. New low-power, wide-area (LPWA) network technologies like LTE-M will give network operators the opportunity to generate significant revenues from the billions of connected things. The LTE-M demonstration leverages a Gemalto wireless module that uses dedicated Cat M1 technology based on Sequans’ Monarch chip to enable a whole new level of low power, low bandwidth IoT connectivity. The module connects to Ericsson’s RBS6000 Multi-Standard base station updated with Cat M1 software. The solution is capable of supporting more than 10 LTE frequency bands from a single hardware device allowing for true global coverage. Dynamic power management technology enables more than 10 years of battery life for standard IoT devices. Samples of Gemalto’s forthcoming LTE Cat M1 wireless module are expected to ship in Q4 2016. “Cat M1 will enable a wide range of new IoT applications to the benefit of Industry and Society at large. We are pleased to work with Sequans and Gemalto to foster the development of an early Cat M1 ecosystem to support, for example, a multi-function Vehicle Telematics application as enabled by this demo” said Thomas Norén, VP Business Unit Network Products, Ericsson. This entry was posted in IoT, M2M (machine-to-machine) and tagged Cat M1 chip, Gemalto, Internet of Things, IoT, LTE-M, M2M, machine to machine, Sequans on November 1, 2016 by Tim Cosgrove. Telit, a global enabler of the Internet of Things (IoT), today announced commercial availability of the UE866-EU, an HSPA module banded for European and Asian markets. With its ultra-compact 15x25mm LGA footprint, the new module is ideal for IoT applications with stringent space constraints such as telematics OBDII dongles, health monitoring devices and connected wearables. Leveraging a hardware and software platform design validated in more than eight million shipped modules, the UE866-EU dual-band HSPA module with fallback to GSM/GPRS provides system integrators with a proven, long-term deployment option for a wide range of IoT applications. The Telit IoT Portal-ready UE866-EU also enables solution providers to take direct advantage ofTelit IoT Connectivity and IoT Platform services designed for hassle-free device-to-cloud onboarding. Telit’s “design once and deploy globally” development philosophy makes it easy for customers to deploy devices anywhere in the world by simply selecting regional or technology variants from the same form factor family. The xE866 family includes broadly carrier certified and regional regulatory compliant 2G, 3G and LTE Cat 1 modules. The UE866-EU is a dual-mode, dual-band UMTS|HSPA, GSM|GPRS, 3GPP Release 7 compliant module. It supports 3G 900/2100MHz and 2G 900/1800MHz bands, delivering 7.2Mbps downlink and 5.76 uplink data rates. The new module supports application development inside module through the Telit AppZone application development environment, includes digital voice support and is ideal for new and upgrade designs, particularly for redesign projects aiming at reducing bill of material costs and/or device dimensions. This entry was posted in IoT and tagged 2G, 3G, 3G module, Internet of Things, IoT, telematics, Telit, UE866-EU on October 5, 2016 by Tim Cosgrove.